Walker Buehler steamed through three Minor League levels en route to his big league debut last September. Before making a return to Los Angeles, he'll refine things one more time on the farm. The Dodgers optioned MLB.com's No. 12 overall prospect to Minor League camp Monday, one of six moves made following the club's 7-6 Cactus League loss to the Brewers in Glendale, Arizona. The move comes after just one appearance for Buehler so far in Spring Training, due to his recovery from a back injury he suffered over the offseason. "With Walker, we want to continue building him up," Dodgers manager Dave Roberts told MLB.com. "He's shown well. Got a late start physically, but we'll try to get him back here to make a start later this week. He understands where he's at." Buehler's one Cactus League appearance this year to date was an impressive one. The 23-year-old struck out five while allowing just one hit in two scoreless innings against the Cubs on March 10. "I think it's more validating what we already know about Walker," Roberts added. "What he went through in September was a learning experience. He's a piece that we're looking forward to and counting on. It's not being tempted. We have a plan in place and feel good about it and just knowing he's going to be a part of it." 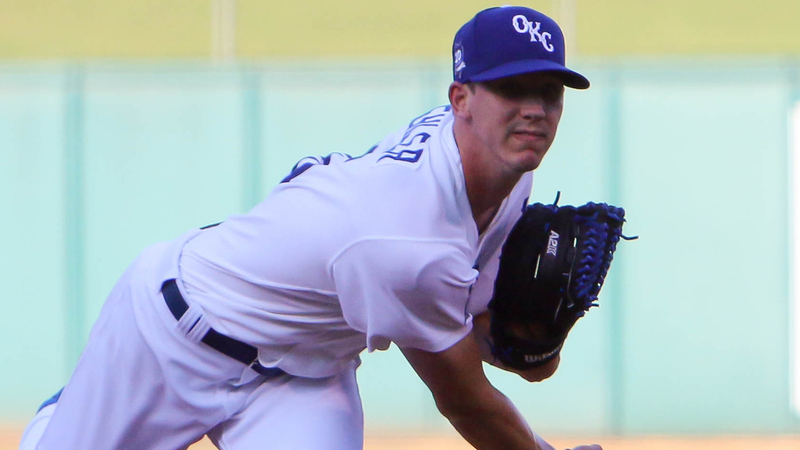 Buehler took the mound last year for his first full season as a professional. Drafted in the first round in 2015, the Vanderbilt product was hurt during his final season in college and underwent Tommy John surgery that year, shortly after signing with Los Angeles. Following a lengthy rehab process and three appearances totaling just five innings in 2016, he took off a year ago. In 28 appearances (19 starts) between Class A Advanced Rancho Cucamonga, Double-A Tulsa and Triple-A Oklahoma City, the top Dodgers prospect posted a 3-3 record with a 3.35 ERA, striking out 125 batters while limiting opponents to a .208 average in just 88 2/3 innings. That performance led to Buehler's first summons to the Majors in September. He didn't fare as well, registering a 7.71 ERA in eight relief appearances for the Dodgers. While he fanned 12 in 9 1/3 frames out of the bullpen at the big league level, he also walked eight and opponents hit .306 against him. The Dodgers still view Buehler's future as being a key component in their starting rotation. A possible future big league batterymate for Buehler also headed back to Minor League camp. Catcher Will Smith, Los Angeles' No. 9 prospect, was reassigned after appearing in 11 Cactus League games. Smith spent 72 games batted .232/.355/.448 with 11 home runs and 43 RBIs in 72 games with the Quakes last year. Los Angeles also optioned left-handed pitcher Edward Paredes and infielder Rob Segedin while reassigning left-hander Manny Banuelos and infielder Max Muncy to the Minor League side.